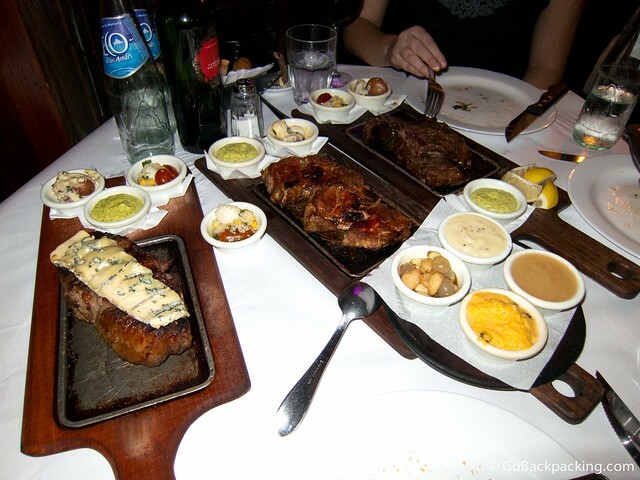 Steakhouses in Argentina are referred to as parillas. These are the restaurants where the hungry go to feed. Where man, woman and child go to indulge in the an endless supply of beef and pork products. Here are my thoughts on three of the best parillas in Buenos Aires. Buen Provecho! La Cabrera is one of the best known parillas in Buenos Aires. Word of mouth amongst travelers and expats ensures anyone who asks for a good place to eat will hear “La Cabrera” in return. There are actually two restaurants, about 50 meters apart. They are both located on Cabrera Street, in the yuppy Palermo Soho neighborhood. Ordinarily, the prices at La Cabrera might put off the typical budget traveler, however the restaurant offers an outstanding discount most days of the week. It's almost too good to believe. Every day of the week, except Mondays and Fridays, the restaurant offers a flat 50% discount on the entire menu, including the wine. This isn't a 2 for 1 deal, or 50% of a second entrée. This is 50% wiped off your entire bill. The catch is you have to arrive early, around 7 or 7:30 PM, as the discount only applies for the first dinner seating. 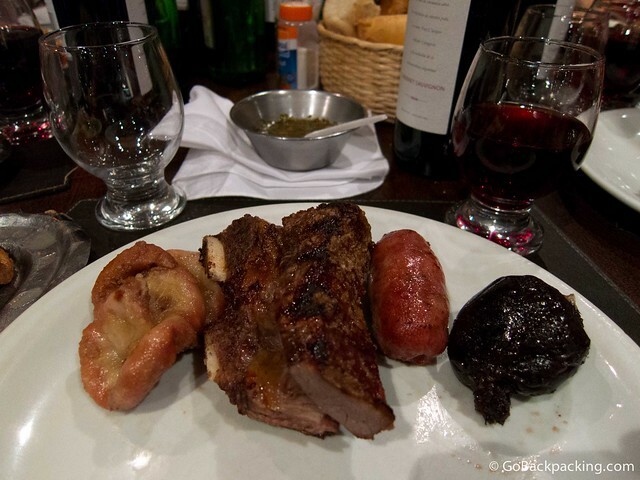 Since Argentines like to eat later in the evening, around 9 or 10 PM, the crowd is mostly foreign. But when you're paying half price, who cares! On my first night in Buenos Aires, Stephanie and Mike took me to La Cabrera for dinner. 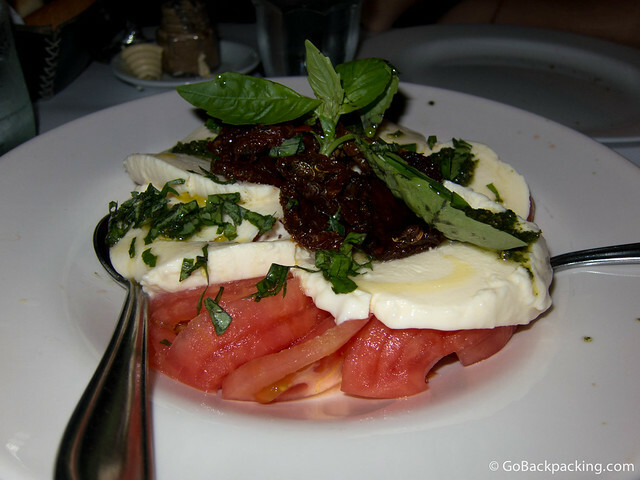 We ordered a caprese salad to share as a starter, and three different cuts of steak. The waiter, who was well aware of the large portion sizes, took it upon himself to halve two of our three entrees. Even so, we'd still be unable to finish all the meat that was delivered. Dessert wasn't even a consideration. Including the wine, tax and tip, each of us paid about $22. The quality to cost ratio is hard to beat. Details: La Cabrera – 5099 Cabrera Street, and 5127 Cabrera Street, Palermo Soho. The night after my feast at La Cabrera, I met up with the other travelers with whom I'd be going to Patagonia. 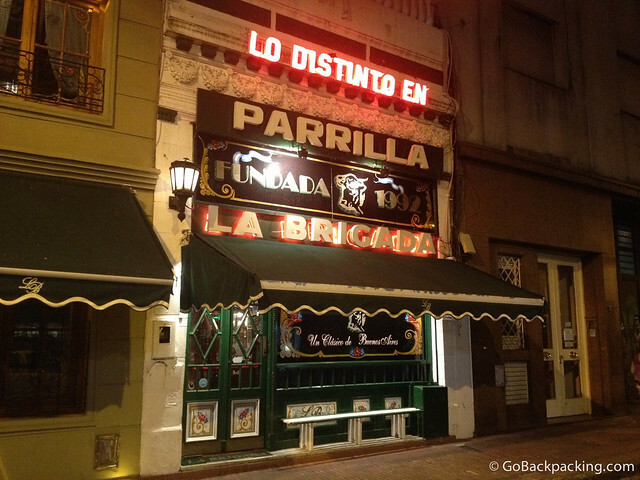 Jens, a Dutch engineer, had been living in the city for a while, and suggested we get dinner at La Brigada, another of the top parillas in Buenos Aires. When I stepped inside the warm, football-inspired interior, I was acutely aware that I was spoiling myself these first few nights in Argentina. However, everyone in the group ordered a typical steak. I broke the mold and went something new, young wild boar breast. Later, when the massive hunks of beef were brought out for everyone else, one was also placed in front of me. I alerted the waiter to the mistake, who then reconfirmed that yes, I did still want my wild boar. As everyone else was eating, I nibbled on my garlic fries. About 20 minutes later, my wild boar was brought out, only it was the ribs, not the breast. I accepted it, despite the second mistake. Thankfully the food made up for the service. The boar had a distinct flavor which I quite liked. Along with a Quilmes beer, the boar, fries, tax and tip added up to about $27. Details: La Brigada – Estados Unidos 465, San Telmo. When friends Mike and Stephanie prepared to leave Buenos Aires after three months, they chose Siga La Vaca for their going away dinner. 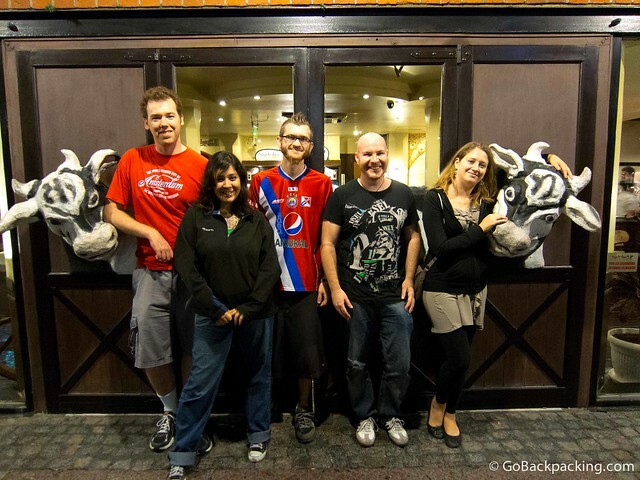 Along with Erica and Shaun @overyonderlust (and their friend), we sieged Siga La Vaca's Puerto Madero location. Even though we arrived before 8 PM, which is early by Argentine standards, there were already people eating dinner. The dining room was gigantic — far larger than either of the other two parillas, and not as nicely decorated either. It felt more like a cafeteria than a restaurant. Of course the big draw for Siga La Vaca is the all-you-can-eat meat buffet. For 120 pesos ($27), you can eat as much meat as you can bear, plus you get access to the salad buffet, and a free drink. If you choose the wine, like we all did, you get your own 750 ML bottle! A few of us got dessert, but that might've cost extra. 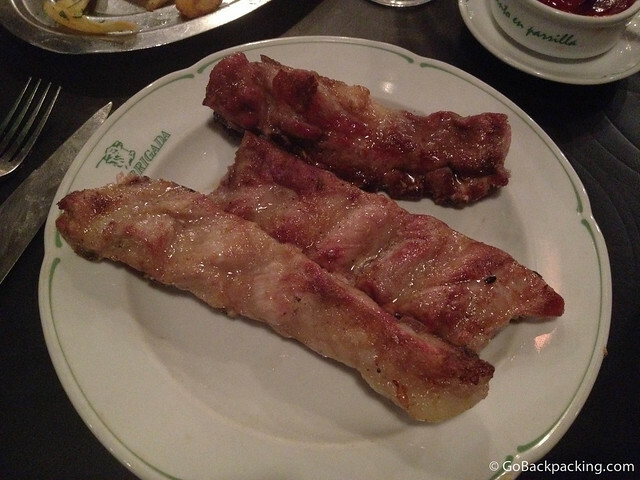 Everyone seemed to love the portions at Siga La Vaca, perhaps because they were unlimited, but as I'm not a big meat-eater, it didn't do much for me. I focused on finishing my bottle of wine instead. Details: Siga La Vaca – Alicia Moreau de Justo 1714, Puerto Madero. Ah that was so good! I miss La Cabrera. I remember I ate so much at Siga La Vaca that I was sick for a week. Worth it though! I’ve bookmarked this for when I get to Buenos Aires in September. I’m having serious steak withdrawal in Southeast Asia. Can’t wait for some good meat! The food looked scrumptious its a shame that didn’t get your order right at La Brigada but it looked like you had a feast at La Cabrera! Eating around 9pm/10pm is really late. But this was a great read and I really enjoyed it. I think my husband would be in heaven at a Parilla, and I love the 50% off except for Monday and Friday. What is special about Mondays? Is it a favourite night for eating out? I was in Colombia a couple of months ago and the meat was fantastic (I live in CHina where the meat is terrible). However even the Colombians were saying that Argentinian meat is much better. Definitely going to check it out soon! 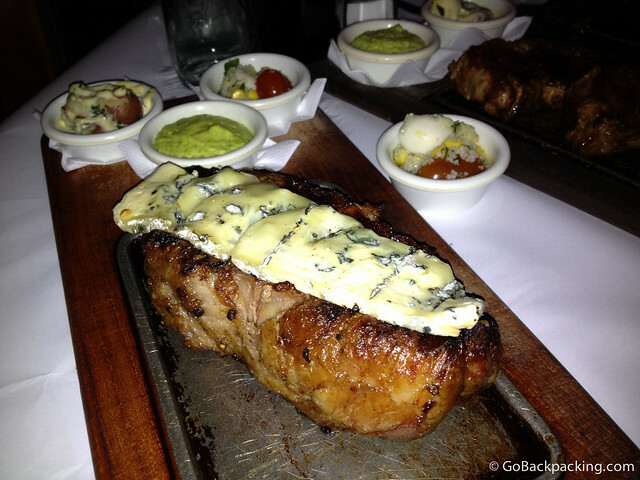 The steak in Argentina is way better than anything you’ll get in Colombia.